Conor Barry re signs for another season. The club's Player of the Year, Barry played a hugely influential role in United's 2018 campaign, contributing 11 goals in 29 appearances. The 23-year-old attacking midfielder's eye-catching form saw the Portumna native pick up three Player of the Month awards at the club in June, July, and August. United manager Alan Murphy spoke of his delight at making Barry his first signing for the 2019 season and he feels the midfielder's re-signing is a statement of intent by the club. "I am really pleased to get Conor on board for 2019. He is a player that has the professionalism, application, and drive required to better himself in every session and game he takes part in. When I took over in the second half of last season, Conor was a player that improved and his confidence went through the roof, with performances to match, as well as his goal tally. "He is a really bright prospect for Galway United and he fits exactly into the profile that we are trying to ingrain in the DNA of the club. Conor has committed to the club and showed that he wants to continue to improve with us. He is buying into what I am saying and he's a really ambitious player that wants to play at the highest level. 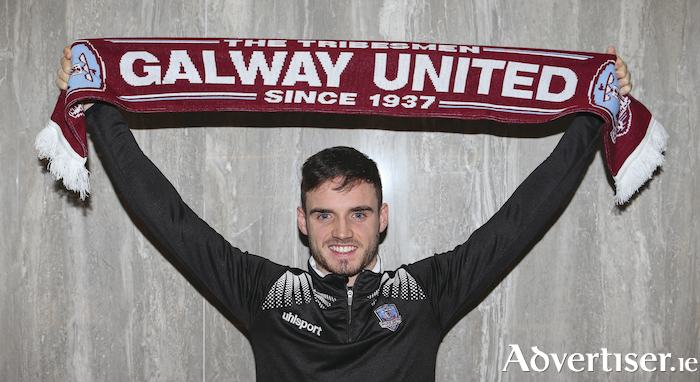 "It shows the ambition of the club and where we're going, that he sees his future can be at Galway United and that we're on the right track to providing that platform for him along with other players." Melody has signed a deal that will take him into his fifth season at Eamonn Deacy Park after joining the club midway through the 2015 campaign. The 21-year-old attacking midfielder has made 76 appearances for United over the last four seasons, with the lion's share of those coming in the Premier Division, as well as scoring a single goal for the Tribesmen against Wexford Youths during his first full season with the club in 2016. Murphy feels 2019 could be a big year for the former Irish under-15 and under-16 international and he is hoping Melody can realise his potential. "Conor Melody is and always was an unbelievable talent. Injuries obviously have given him slight setbacks, but I see next year as being a huge year for Conor. I see it as a year to make the progress that Conor Barry made in half a season. I really think Conor is a perfect profile for Project DNA. He is invested in the club, he's a local lad. "He is a player that is professional and has all the characteristics that I am looking for. He is the first person I thought of when the profile came together, that he fitted it, so I am really excited about him." Eighteen-year-old Adam Rooney made his first team breakthrough last season after progressing from the U17s and U19s over the last two seasons. The 6’4? centre-back started against Sligo Rovers in the EA SPORTS Cup in April, and made another five league starts, while also contributing to Ireland's schools' victory in the Centenary Shield. Murphy believes next season will be a "breakthrough" year for Rooney. "He just shouts potential. Adam has many different abilities, he can be a tough-tackling centre-half, he can be a ball-playing centre-half and he’s very mobile. That’s just Adam Rooney in 2018, what will he be like in 2020?